Soul Serenade: B.B. King, "Worried Life"
All of the Kings of the blues guitar are gone now. We lost Freddie King back in 1976, and then Albert King in 1992. The most renowned member of this esteemed trio left us on May 14 when B.B. King died at his home in Las Vegas at the age of 89. B.B. King was one of those people who seem to have been a part of our lives for as long as we can remember. It’s no wonder that we feel that way since his recording career began in 1949, and by that time he had already been a singer in a gospel choir, a performing musician, and a DJ. He had been born Riley B. King on a cotton plantation near the town of Itta Bena in 1925, and considered nearby Indianola to be his home town. His mother left his father when Riley was four years-old, and he was sent to live with his grandmother in Kilmichael. When he was 12 years-old King got his first guitar, which may have been given to him by his cousin, Bukka White. By 1941 King was working on a plantation and listening to the King Biscuit Time out of Helena, Arkansas on the radio during his breaks. He was teaching himself to play, and dreaming of becoming a radio musician. Two years later King had his first gig as a guitarist, accompanying the St. John’s Quartet when they performed at area churches, and yes, on the radio at WGRM. Three years later King went up to Memphis, hoping to follow in the footsteps of his cousin Bukka White. It didn’t work out though, and two years later he moved to West Memphis, Arkansas. There he performed on Sonny Boy Williamson’s radio program on KWEM and began to gather an audience. That led to local gigs, and a ten minute radio show of his own on WDIA in Memphis. 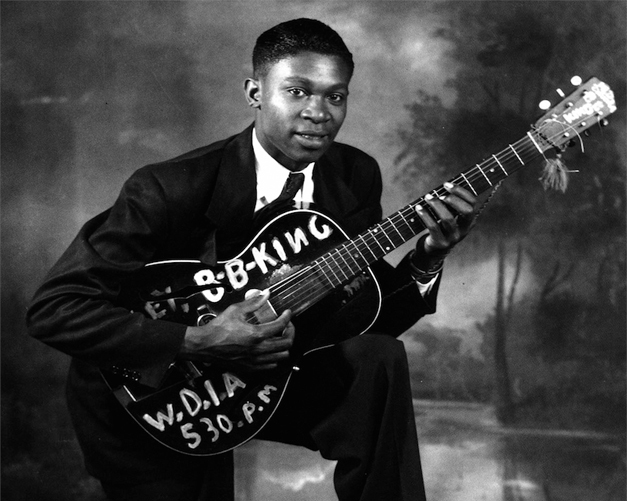 It was while he was at WDIA that King got the nickname “Beale Street Blues Boy,” which was eventually shortened to B.B. There also he met T-Bone Walker, and listening to Walker convinced King that he needed to switch to electric guitar. After a short stint with Nashville’s Bullet Records in 1949, King’s recording career began in earnest when he got a deal with RPM Records out of Los Angeles. Many of King’s RPM releases were produced by Sam Phillips, who founded Sun Records a few years later. Before long the B.B. King Review was on the road, crisscrossing the country playing theaters, small clubs, and juke joints in the south. It was on this tour that his guitar got the name Lucille when he rescued her from a fire that started in a club when two men got into a fight over a woman by that name. “3 O’Clock Blues” was a #1 hit on the Billboard Rhythm and Blues chart in 1952, and the hits just kept on rolling. Records like “You Know I Love You,” “Woke Up This Morning,” “Whole Lotta Love,” and “Sweet Little Angel” were among King’s many 1950’s hits. In 1961 a single called “Someday Baby” reached #16 on the R&B chart. “Someday Baby” has been recorded by many artists, under several different titles. The song was recorded Big Maceo Merriweather in 1941 with the title “Worried Life Blues.” Merriweather’s song was inspired by an earlier song called “Someday Baby” by Sleepy John Estes. The Estes record was released in 1935. Since that time, versions of the song have been recorded by Muddy Waters, Ray Charles, Freddie King, Eric Clapton, Bob Dylan, and many others. B.B. King wasn’t done with with “Someday Baby” however. In 1970 he re-recorded the song, this time calling it “Ain’t Gonna Worry My Life Anymore.” The song appeared on a seminal King album, Indianola Mississippi Seeds. That same year, King’s former record company reissued his “Someday Baby” under the title “Worried Life.” The reissued single reached #48 on the R&B chart. And still King wasn’t done with the song. It appeared once more, this time on Riding With the King, his 2000 collaboration with Eric Clapton. B.B. King was a legend long before his death this month. In 1980 he was inducted into the Blues Hall of Fame, and seven years later into the Rock and Roll Hall of Fame. King received the National Medal of Arts in 1990, and he was awarded the Kennedy Center Honors in 1995. The Presidential Medal of Freedom was given to him in 2006. B.B. King had been in ill health for some time and seemed to stay out on the road much longer than he should have. This week the papers have been filled with allegations by his daughters that he had been poisoned by his managers. It remains to be seen what will come of this, but it all adds up to a sad end for one of the greatest musicians of our lifetime. King lived a long and full life, and a dignified death is the least that he is entitled to.